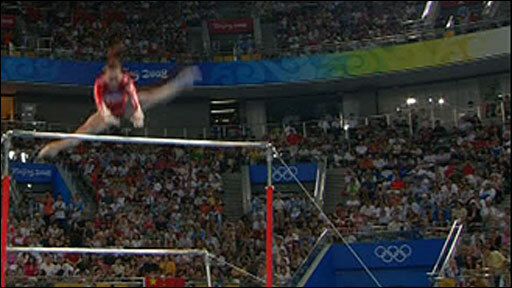 China's He Kexin won the women's uneven bars while Britain's Beth Tweddle just missed an Olympic gymnastics medal. He scored 16.725 points, the same mark as Nastasia Liukin, but the Chinese won because Liukin earned the lowest of all the pairs' execution scores, an 8.80. Yang Yilin made it two Chinese on the podium as she came third with 16.650. Afterwards Tweddle, who finished fourth despite a very difficult routine, said rumours she was quitting were untrue and she would return after a holiday. "I'm going to continue, I don't see myself quitting now, although I will have some time off," she said. 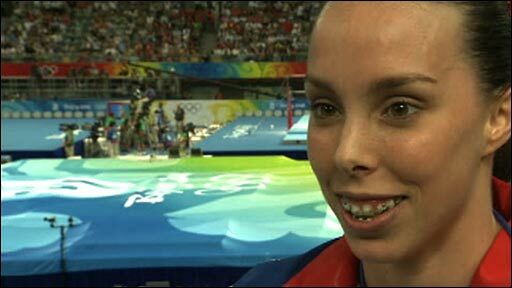 Tweddle, the 2006 world champion, overcame a rib injury to compete in Beijing and only just qualified for the uneven bars final, taking the eighth and final spot. "I was pleased just to be in the final," she told BBC Sport. "My dismount is normally not a problem but I just didn't get enough height and to be honest I thought I was going to end up on my face." "My dream has been to be in the final. Now I'll have to leave it to London in 2012 to get a medal. "I came into this final in last place, so I just had to go out there and do it and I am pleased with my performance. It was a good result, I am not disappointed with fourth."